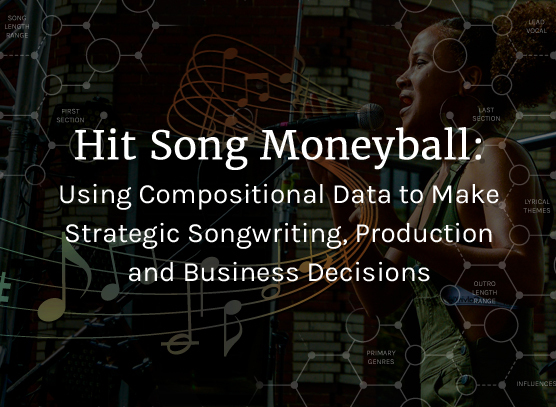 Hit Song Moneyball was first presented by Hit Songs Deconstructed at the Music Business Association’s Annual Conference, MusicBiz 2018. Today’s music industry has become more and more reliant on data for sales, streams, downloads, engagement and other like metrics. Compositional analytics are equally important. Led by Hit Songs Deconstructed Co-Founders Yael and David Penn, this presentation focuses on current trends and how compositional data points extracted from hit songs can be strategically used to make songwriting and business decisions. The presentation includes an overview of Billboard Hot 100 Top 10 compositional trends, a look at the evolution of songwriting memes and how artists have capitalized on them, and a benchmarking of two singles to uncover potential reasons why one rose to the top of the charts while the other did not. Send me news and updates from Hit Songs Deconstructed. Send me offers from carefully-selected partners.